In the Company of Crows: Creating Collaborative Cultures to Crush the Competition. Business is, by nature, a game of hawks. But what happens when the competitive nature of your employees prevents cooperation and constrains performance? We often hire those who live by the “whatever it takes!” rule, but is that really the best strategy for an individual or a larger organization? In the Company of Crows brings together the latest scientific research to convey, in a simple and entertaining demonstration, how cooperation is king in the competitive world of business. Through her humorous and interactive examples, Rebecca brings biology to business, exploring how to promote internal stability, innovation, and cooperation. Maximizing in-group affiliations among employees by creating a culture of cooperation allows an organization to gain the competitive edge against external competition. 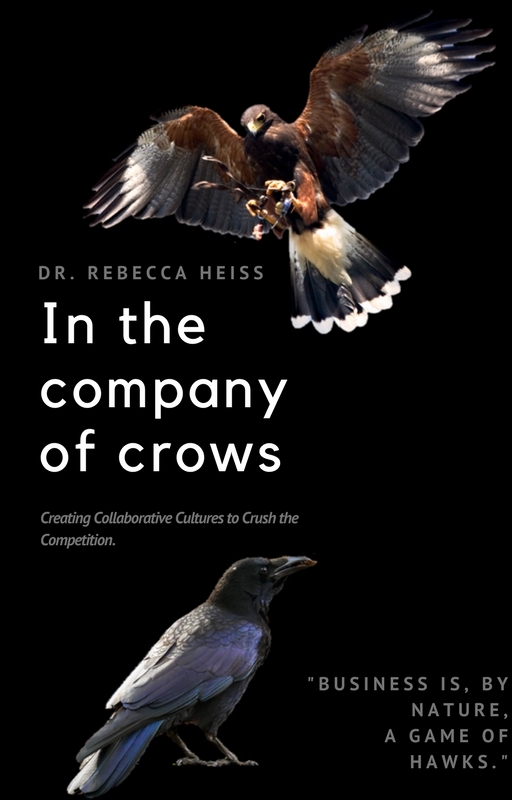 By understanding how behaviors that yield short-term individual gain can ultimately reap negative consequences, Rebecca helps clients gain a competitive edge by embracing their inner cooperative crow to the benefit of themselves and their organization.